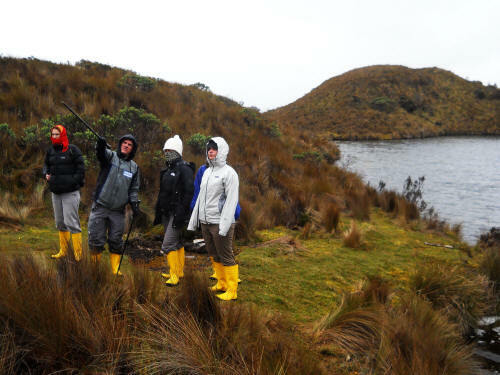 Cajas National Park is located between 3150 - 4445 meters above sea level (masl) in the narrowest part of the Andes where is the center of Northern Andean endemism, both for flora and fauna. Due to its geomorphological and glacial characteristics, it shows biogeographic peculiarities facilitated by isolation. 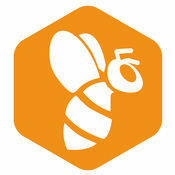 Thus, many species have diversified and specialized, making it an area of global importance. An interesting anecdote: Before Cuenca was accessible by road from Quito, cars were taken apart in Guayaquil and carried over the Inca trail on the backs of Indians. The glacial U-shaped Llaviuco Valley shows the marks of the glaciers that covered the region during the ice ages. At the flat bottom of the "U" shaped valley, that was formed by glaciers during the last ice age, is the 42m deep Llaviuco Lake. The climate of the Park is special, as humid air coming from the coast collides with the cold air that ascends from the east. There is no particular weather pattern and frequent frosts, drizzles and fog may be followed by days of intense sun during most of the year. With temperatures ranging from -2 to 18� C and precipitation fluctuating between 1000-2000 mm per year, the area is very humid indeed, which is why it serves as a drinking water supply area for the city of Cuenca. 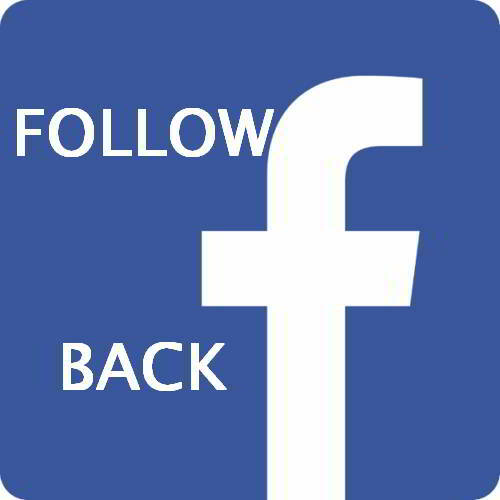 In the Park, the main Rivers Tomebamba, Maz�n, Yanuncay and Mig�ir, supply drinking water to the city of Cuenca and also contribute to the Paute Hydroelectric Reservoir, the main source of electricity for the entire country. The Park is also part of the Luspa Sunincocha, Atugyacu, Jerez, Angas and Yantahuaico watersheds, which drain towards the Pacific and the Llaviuco, Maz�n and Soldados rivers, which drain into the Amazon basin. 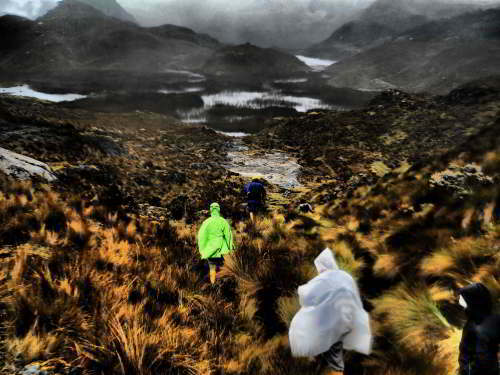 235 glacial lakes larger than a hectare are located in Cajas National Park. 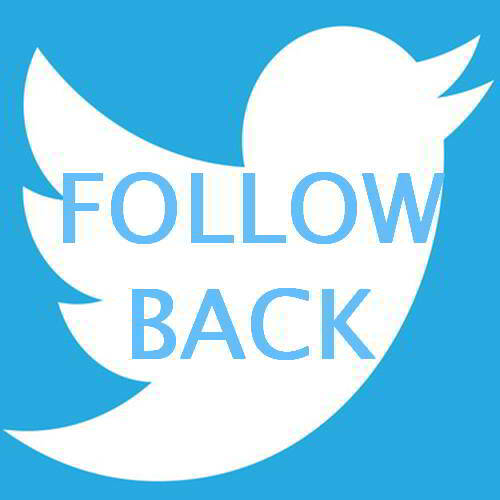 That is why it has been declared a Ramsar wetland of International importance on August 14, 2002. 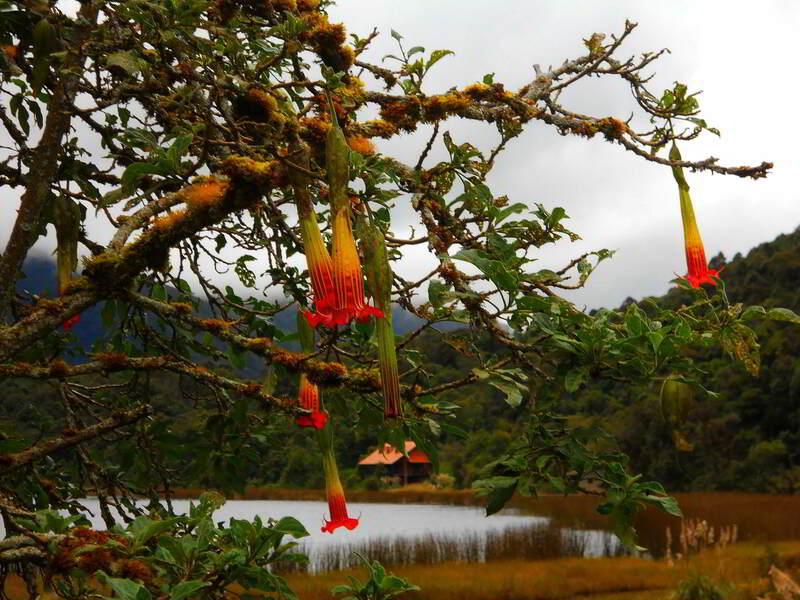 The most important lakes are: Lagartococha, Osohuaycu, Mamamag o Taitachungo, Quinoascocha, La Toreadora, Sunincocha, Cascarillas, Ventanas y Tinguishcocha. 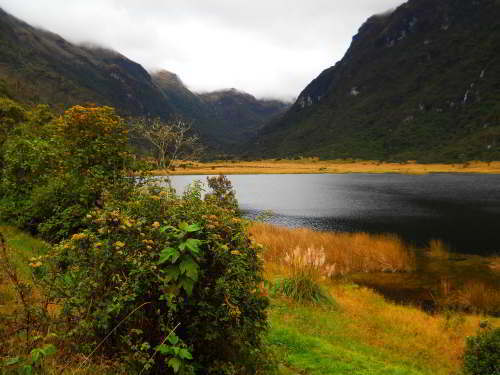 Of special interest is the 42m deep glacial Lake LLaviuco in the LLaviuco Valley and source to the Llaviuco River. 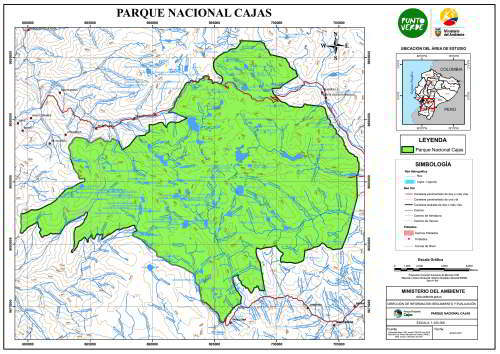 on June 6, 1977, El Cajas was decreed a National Park, by the Interministerial Agreement a-203 in the Official Register, on July 4, 1977 R. o. N � 317, covering and area of 28,544 ha. 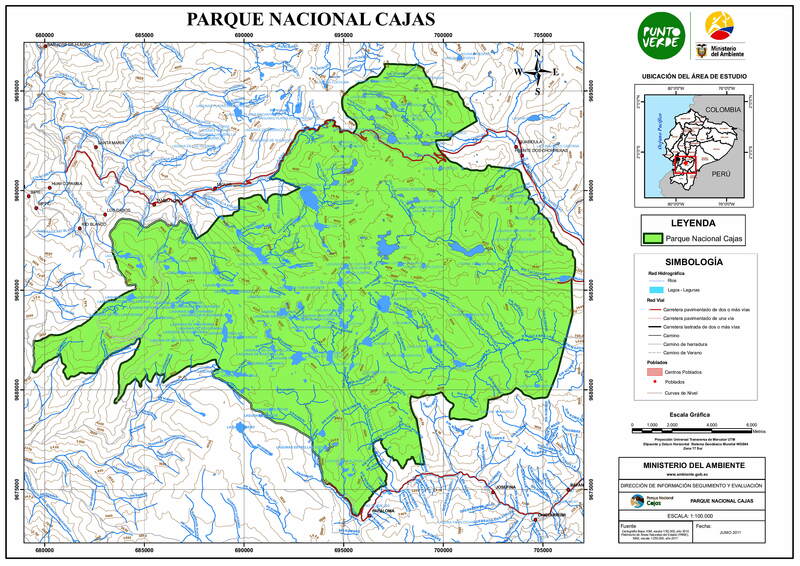 It is administered by the The park is managed by the "Corporaci�n Municipal Parque Nacional Cajas" of the Municipality of Cuenca, as it provides the drinking water for the city. It should be noted that it is one of the best managed areas in the country. There is a great visitor center along the highway, while the main entrances is at a lower elevation. The Soldados-Angas entrance gives access to the Llaviucu Valley and Lake about 17 km northwest of Cuenca. The lake, located in the middle of the valley, is a great place for hiking along its three trails: Uku, 2 km around the lake; Zig Zag, 1.3 km leading to a great overlook; and San Antonio, 2.7 km, which leads through a beautiful cloud forest at the beginning of the valley. Cajas National Park Soldados-Angas Entrance at LLaviucu. Visitor center at the Tres Cruces highway pass. Another activity is fishing and bird watching; the latter being great as the trails cross several different ecosystems, such as montane forest, p�ramo, lake and grassland. 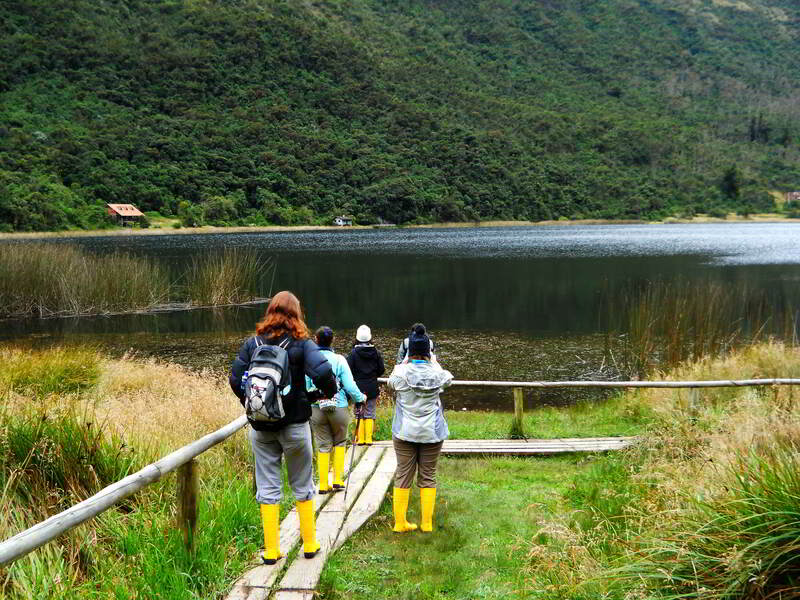 Visitors enjoy the landscape of Lake Llaviuco and the cloud forest on the the lower mountains of the park. 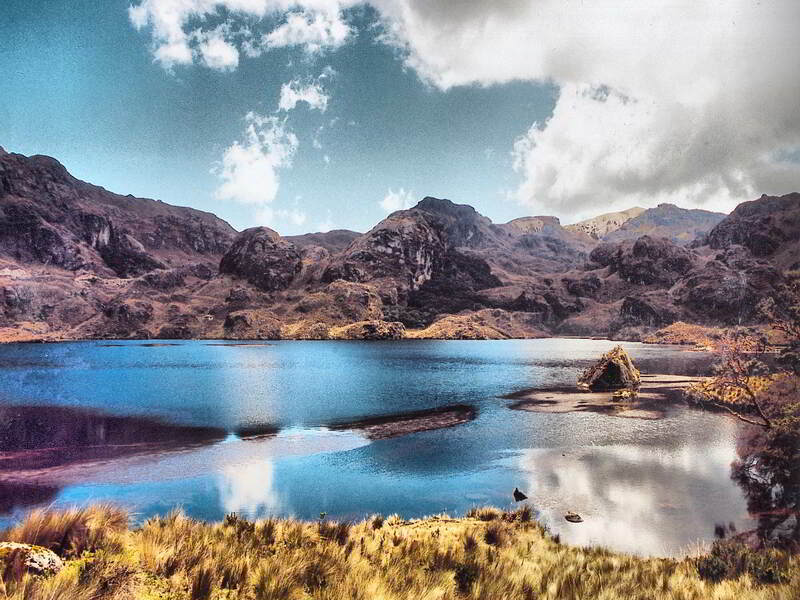 Lake Toreadora lies at 33 km from Cuenca along the coastal highway. A path from the visitor center leads to the lake. 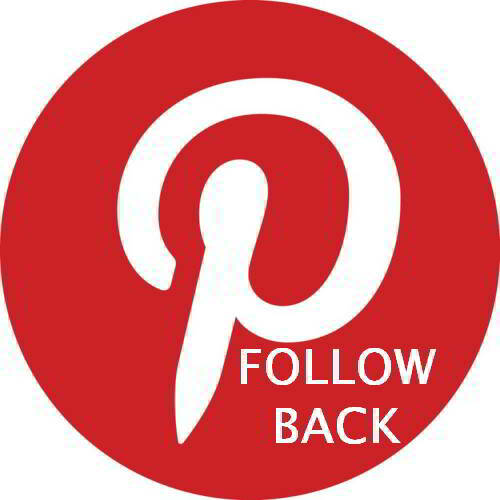 You can visit some remnants of Polylepis forest as well as the p�ramo. In the open grassland of the paramo one finds characteristic species herbs. The Toreadora Lake, on a day of bright sunshine. Remember to always use sun block as the sun radiates through the clouds. Mysterious lakes on a foggy day. 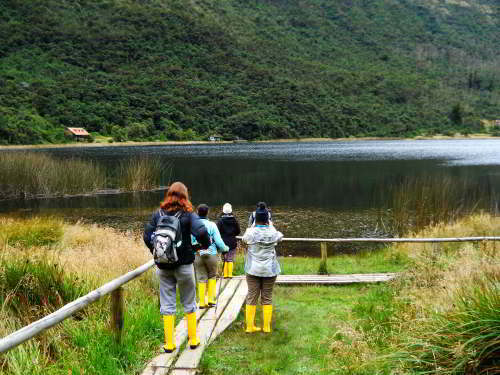 Lake Illincocha at 1 km from the visitor center where you will find some remnant of Polylepis forest. Lake Lagartococha is the largest water body in the park. You may take several trails to get there. It takes about three hours from the road; It is possible to camp out on its shores and the place is very popular for sport fishing. At his side is the "Cave of the Muertos". 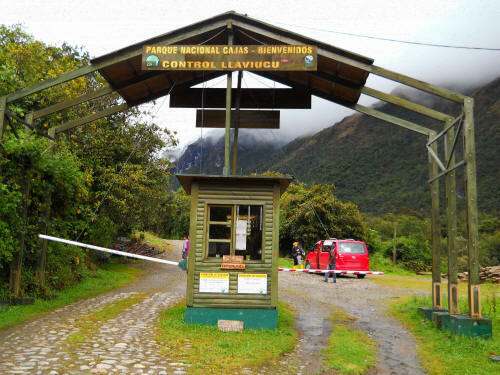 The Loma de Tres Cruces is the highway pass with a natural overlook at 4200 masl at the continental devide between in the Pacific coast and the Amazon. On our excursions you sometimes need to cross a narrow creek. 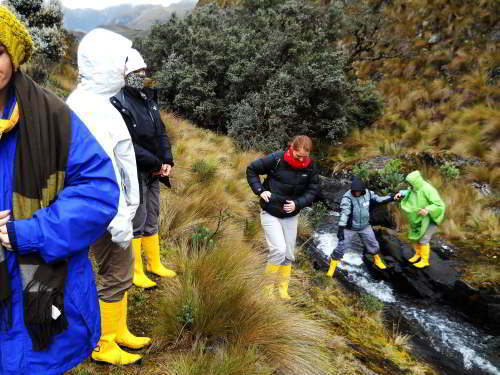 Our expert guide tells you all about the mysteries of the paramo Andes meadows. Lake Taltachuno can be reached by a trail from Toreadora Lake. From there you can follow a section of the Inga��n, or Inca Trail, towards the Luspa Cave. The ancient the Inca Trail has been restored over a distance of 4 km, between the Luspa Cave and Lake Mamamag. At Mamamag you will find remains of pre-Inca structures represented by stone steps and foundations of some kind of building. The Burines Sector: There are the Bur�n Lakes which are popular for fishing and camping. The flora and fauna are in good state of conservation and one can often see deer. The Ventanas Sector: You arrive at this sector by the road that leads to the town of Angas. To enter the lagoons it is necessary to park side of the road and to advance on foot by the trails that lead to the lagoons of Ventanas, Angas and Cascarillas. Caminates: There are many trails in the area; However, before hitting the trail get information and advice from the rangers. 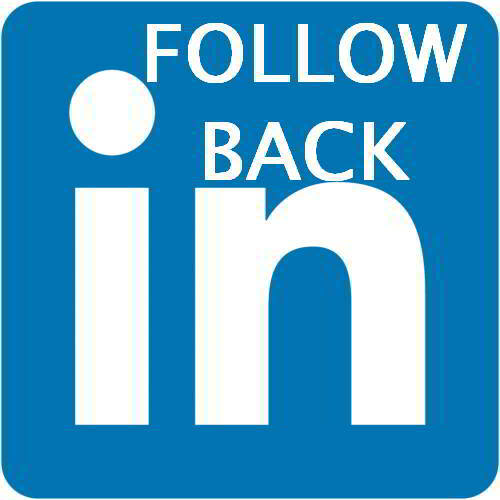 Weather conditions, can change fast and cause confusion for hikers. Virgin de las Cajas: In the Eastern bufferzone is the Garden of the Virgin, a place of religious pilgrimage. Los Paredones: these are the remains of great pre-Hispanic walls found in the area. This complex of structures is located in the north-west of the park, in the parish of Molleturo, and comprises buildings made in part by the Ca�aris as well as during the Inca Rule. These archaeological remains are in good condition and comprise a tambo (inn), a ceremonial platform, retaining walls and vestiges of an access path. The Playas Encantadas Lakes are in the northern sector of the park. Very attractive, and a great place to watch condors that frequently nest there. 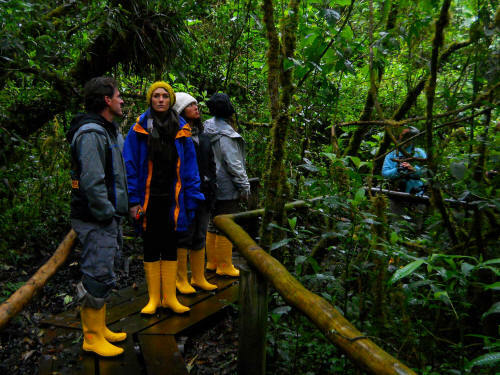 Our excursions with a highly experienced guide gets you to explore some of the best inner Andes high forest. Getting the smell of a native aroma kitchen plant in the wild. 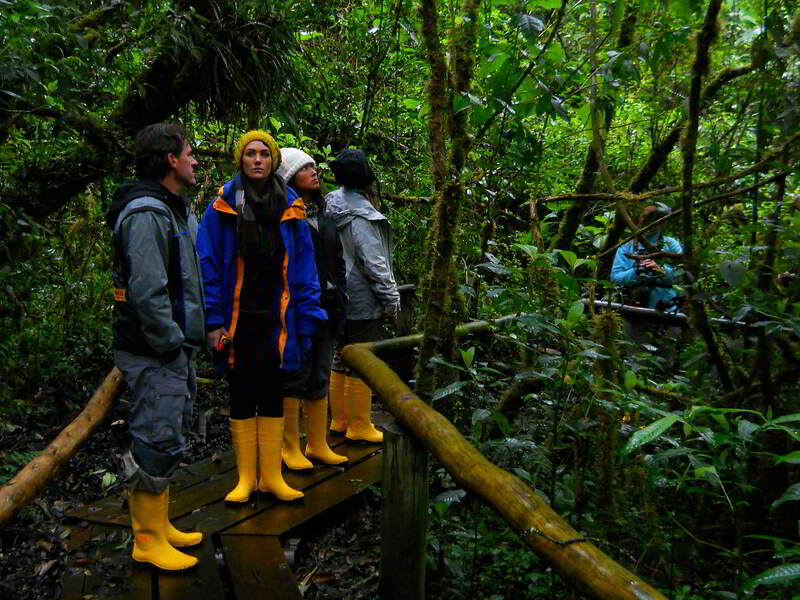 El Cajas National Parks Tours are part of our National Parks Tours to Ecuador. Evergreen high montane forest (2900-3400 masl): It is located to the east of the Park, in the microbasins of Llaviucu and Maz�n. It has two plant associations: one dominated by Weinmannia fagaroides and Ocotea heterochroma (Lay another with predominance of Hedyosmum cumbalense.) This formation is located to the west of the Park, in the microbasins of Jerez and Yacutuviana. 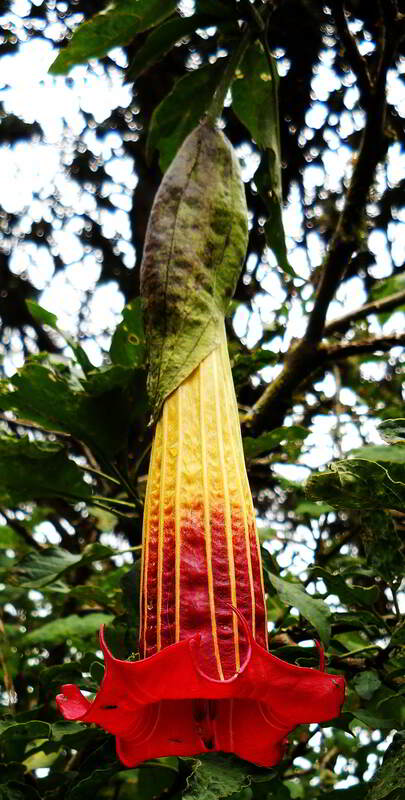 The borders of ravines and streams There is no clearly defined stratification and canopy trees have an average height of 12 m There are a large variety of epiphytes, especially orchids and bromeliads. 102 are woody) and in the forest of Maz�n, in the limits of the Park, were identified 300 vascular species (80 are woody. 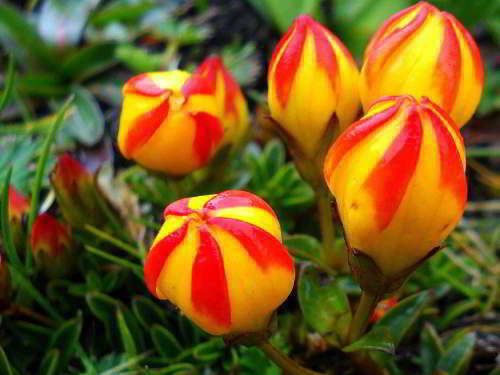 Altimontain shrubland (around 3400 masl) with dwarf trees (especially Polylepis) and shrubs with leathery leaves, such as Berberis lutea, Chuquiraga jussieui and Pernettya prostrata (Ericaceae). 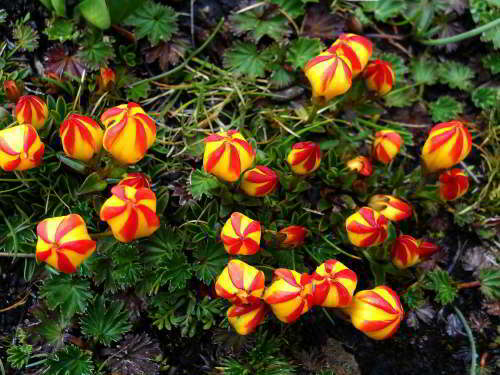 It is found in gullies and canyons, along the banks of streams and in areas around lakes. 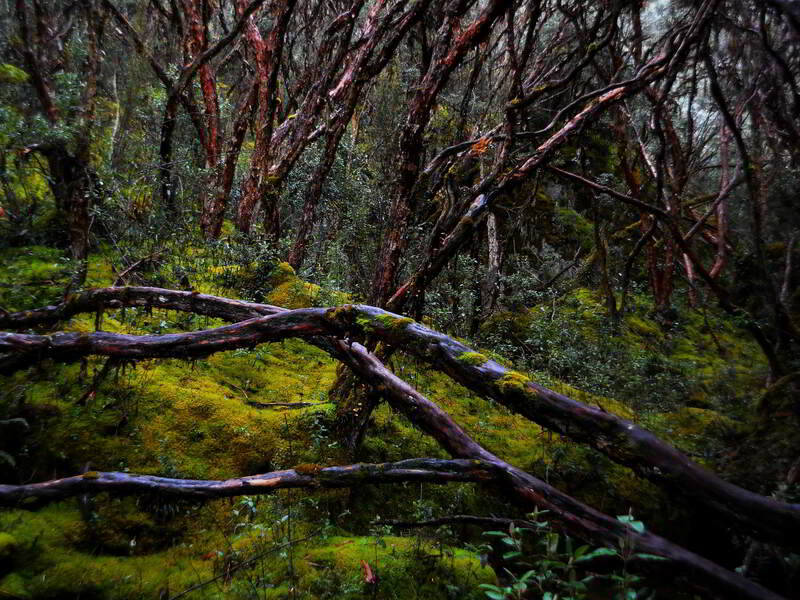 The woody species are not very abundants, but these forest fragments are covered by lots fern and moss epiphytes, which provide great cover for birds and small mammals. 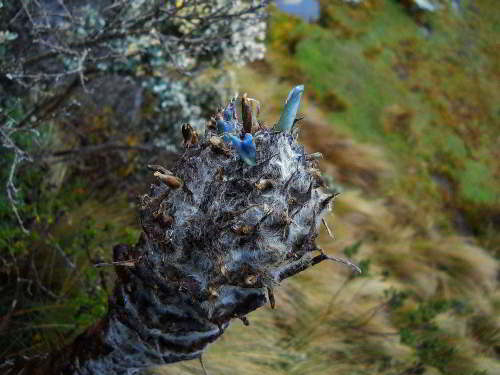 In many parts of the country the Polylepis forests of the high Andes have been cut, but some tall groves have survived in El Cajas National Park, and small remnants of groves of dwarf trees and shrubs can now slowly recover under the full protection of the park. 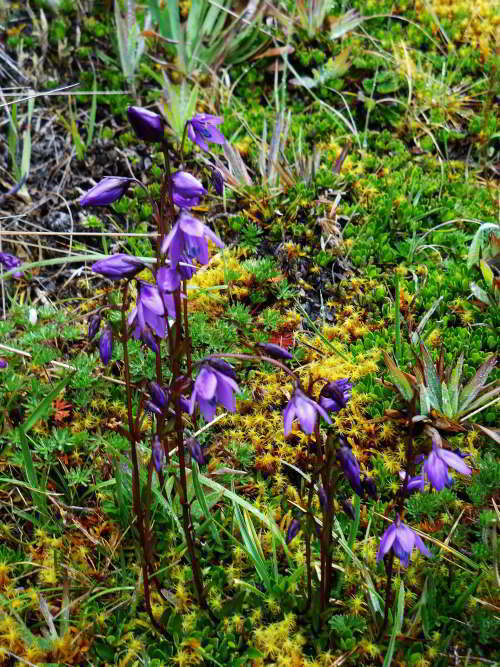 Herbaceous p�ramo (3400 - 4000 msnm): the most common ecosystem of the park in which grassy species dominate, particularly Calamagrostis intermedia as well as herbs such as Bartsia laticrenata and Senecio chionogeton and species of small herbs like the "Andes Tulip". 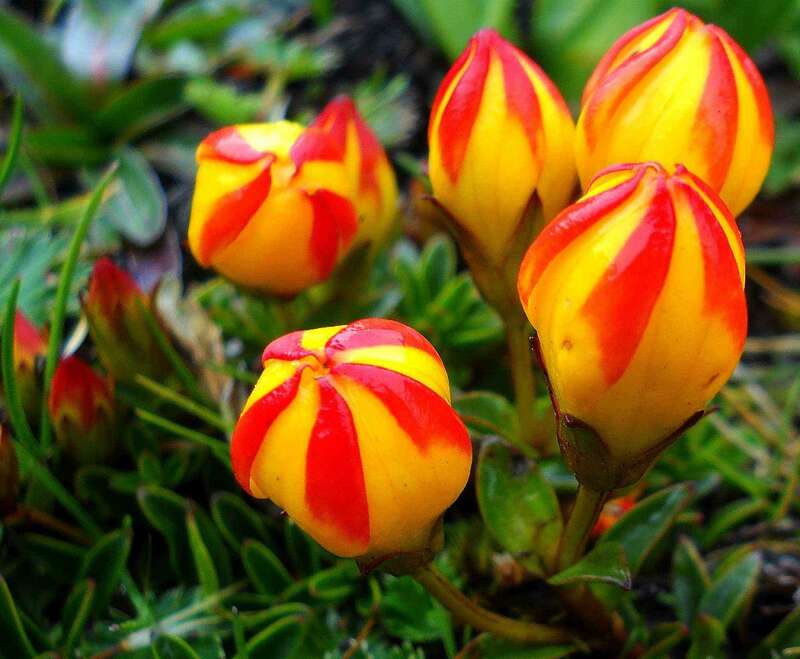 Locally called tulips, they are charming bright gentians from the park's p�ramo. P�ramo de cushions (4000 masl): is dominated by cushion species like Azorella pedunculata and Plantago rigida. 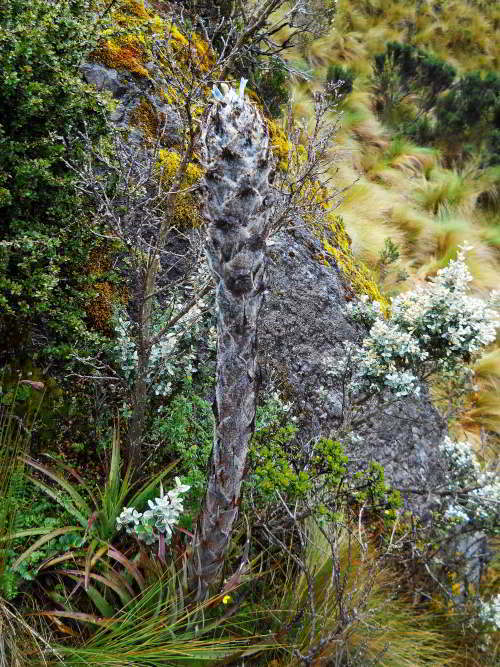 Gelidoftia (4000 - 4700 masl): At the top of the highest hills such as the Arquitecto and Amarillo Peaks, 2 rare species are found: Nototriche hartwegii and Valeriana henricii, which are adapted to growing in bare sand and cracks. Montane marsh: This ecosystem is found along the laje shores. Dominant families are Juncaceae and Cyperaceae, which can grow up to 1.50 m. while their roots grow in the water. In the lakes at lower elevations, such as Lake Illincocha, aquatic macrophytes may dominate such as Myriophyllum quitense. In flooded areas (marshes or peat bogs), soils with anaerobic conditions also contain moss cushions. 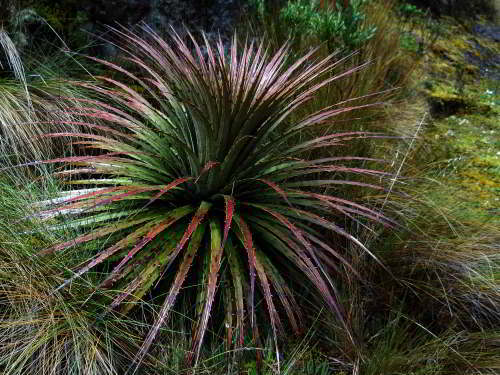 This subtype of vegetation appears rather dispersed in wet ​​grassland and best represented in the Totoracocha Valley, as well as in the microbasins of Soldados and Angas. There are about 500 vascular plants in Cajas National Park, distributed over 243 genera and 70 families, which represent about half the genera of vascular plants recorded in the country's paramos. With 85 species, the largest family is Asteraceae, followed by Pteridofitas (ferns) with 64 taxa, Poaceae (grasses) with 42 and Rosaceae with 22 species. 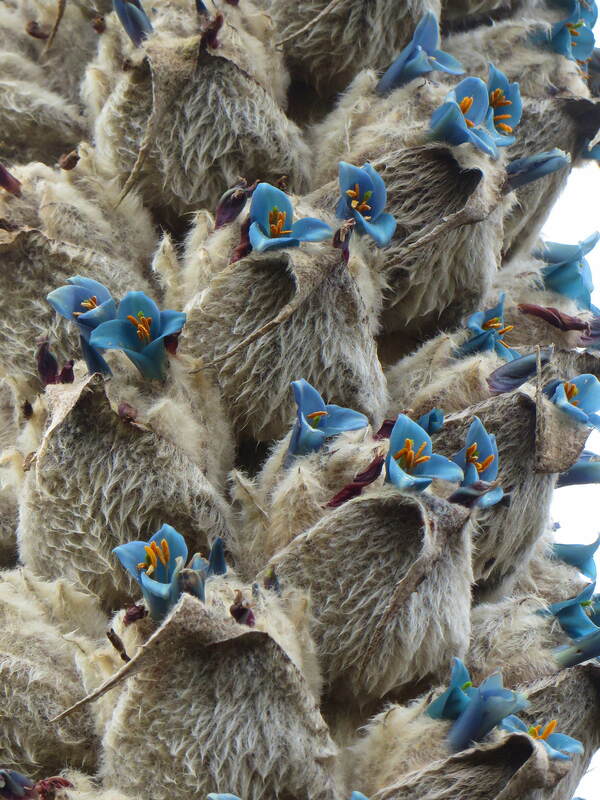 The Hercules Club, Puya clava-herculis, one of the oldest representatives of the Bromelia family, is a characteristic species of the p�ramo. 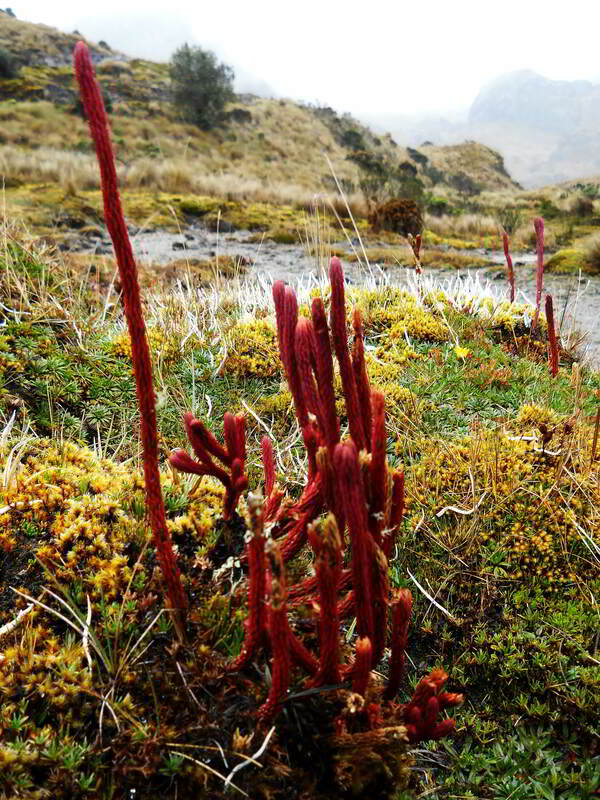 The plant communities of the Inter-Andean and Pacific slopes, both with very similar environmental conditions, have partially different species of plants. 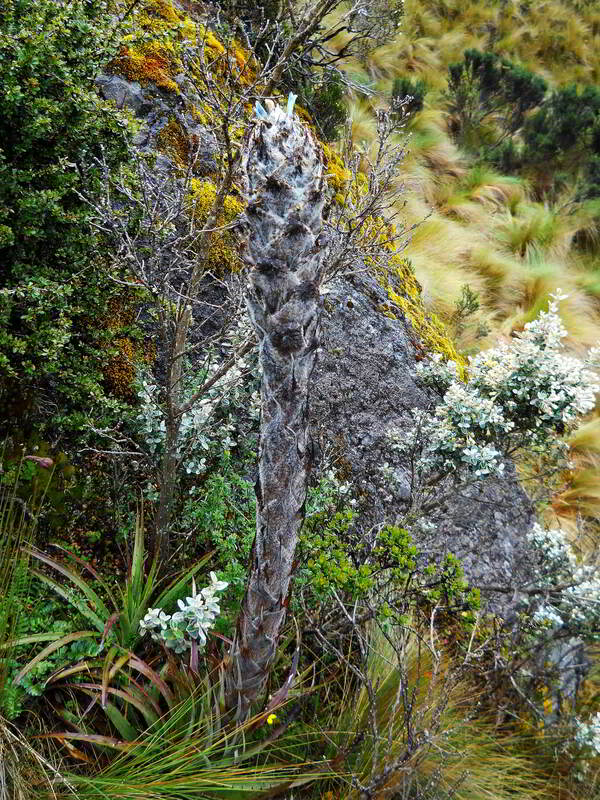 For example, the dominant species of the Inter-Andean forests are: Prumnopitys montana, Hedyosmum cumbalense and Ocotea heterochroma, whereas the same species are absent at the pacific slope, where, the dominant ones are: Clethrarugosa (Clethraceae), Myrsinecoriacea and Freziera verrucosa. Something similar occurs in the p�ramos, where, Polylepis lanuginosa, occurs along the western flanks, while Polylepis reticulata grows along the inter-Andean flanks. 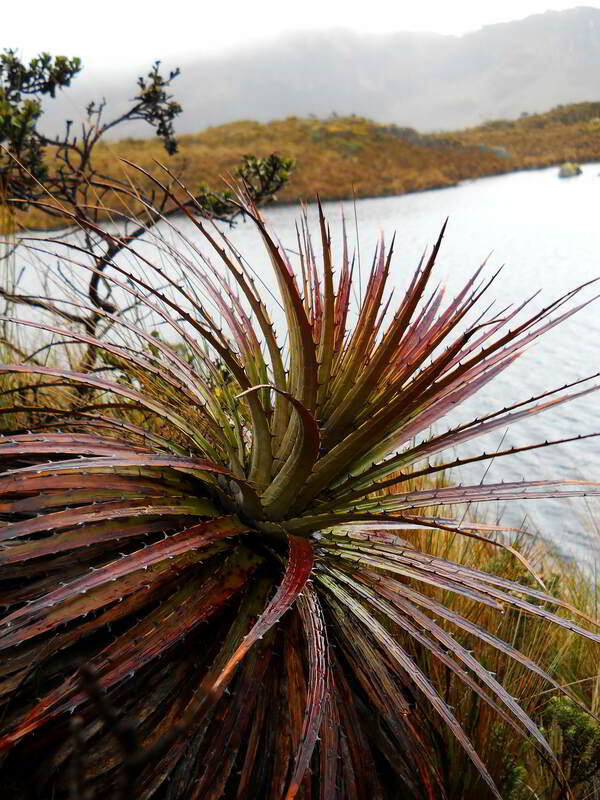 Cajas National Park is considered a center of endemism and evolution of many taxa: At least 16 species of vascular plants are unique to the area (12 are endangered and 4 are threatened). In addition, 71 species are endemic to Ecuador. 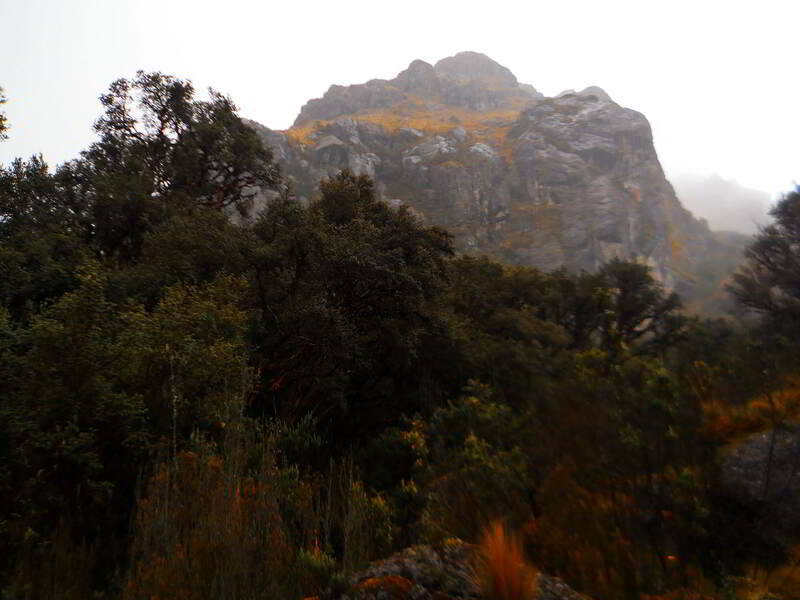 The genera with the most endemic and rare species are Polylepis and Valeriana. In the case of Polylepis, 5 species are endemic: Polylepis weberbaueri, P. reticulata, P. lanuginosa, P. incana and P. sericea, (Rosaceae). 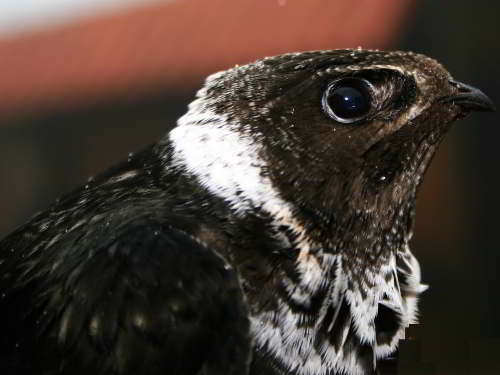 The genus Valeriana is represented by 13 of the 45 species registered in Ecuador. 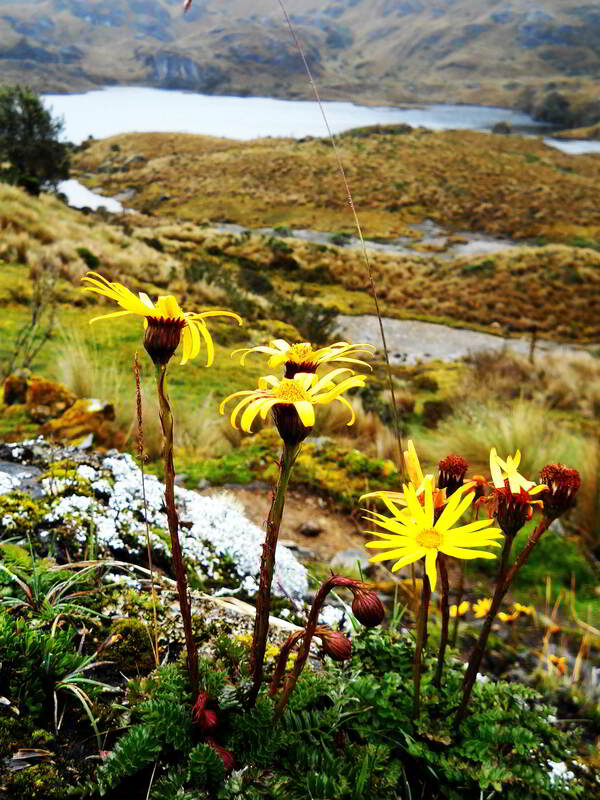 In addition, five species are present only in the herbaceous p�ramo of Cajas and nowhere else in the rest of the country; two of them, Valeriana secunda and V. cernua, are endemic exclusively to the Park. During the rainy season, the paramo is covered with the colorful flowers including a very primitive plant: red licopodium. chucuri o comadreja (Mustela frenata). 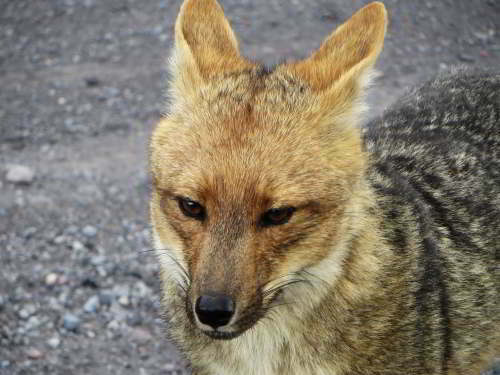 The Andean Fox is rather common in the reserve but shy and not often seen. 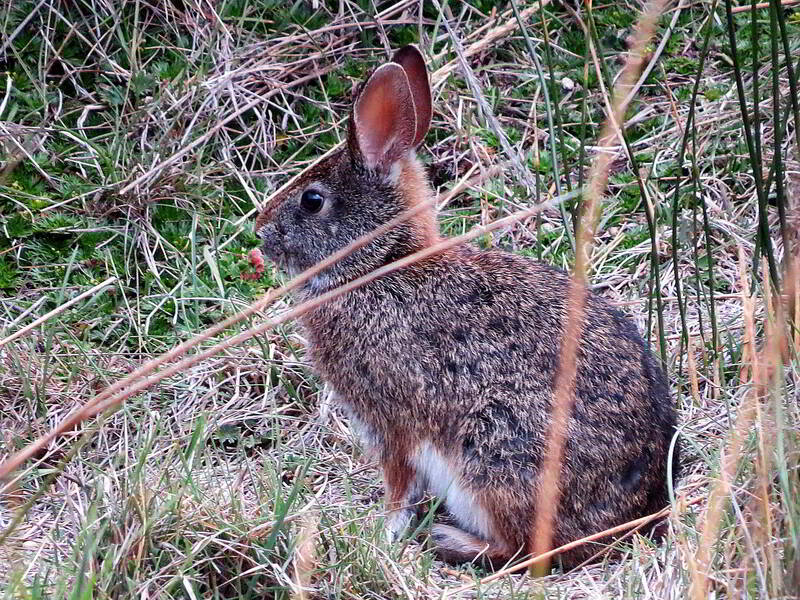 The Brasilian Cottontail is an important source of food for the Andean Fox. 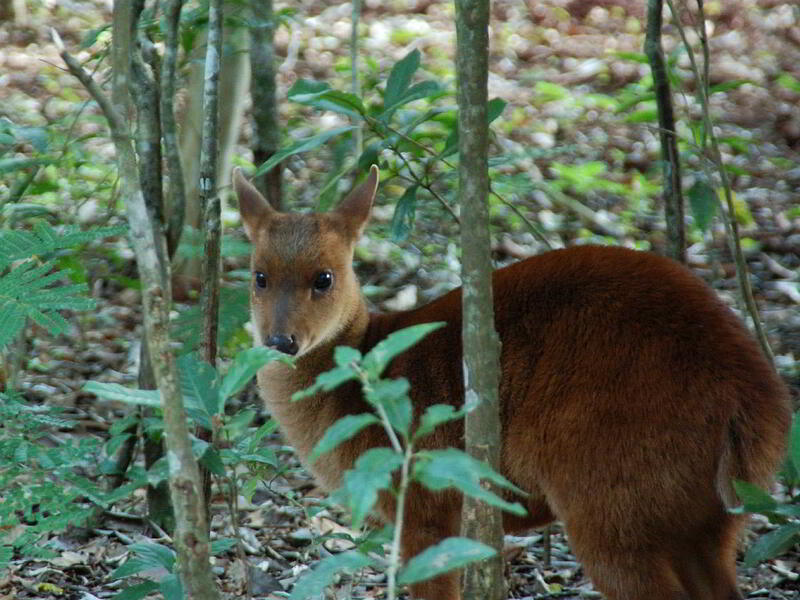 The Andean Red Brocket Deer, Mazama rufina, is omnipresent and rather common in the Andes, although permanent persecution keeps them wary. 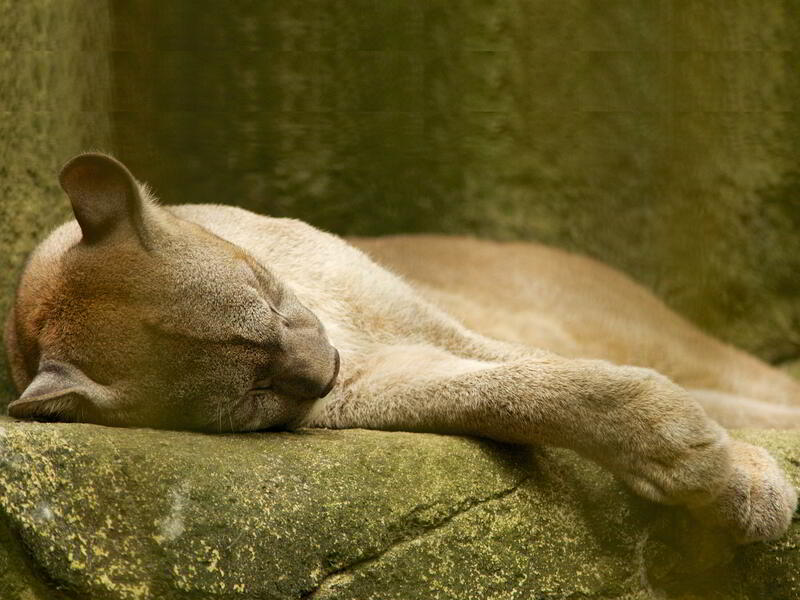 Pumas are widely spread throughout the highlands and the Amazon, but they keep a safe distance from humans and are rarely seen. 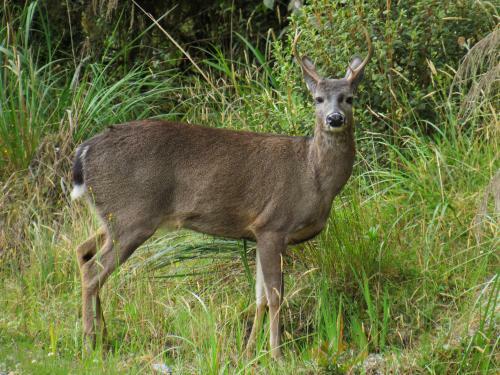 White Tailed Deer are also widely distributed in the Andes and Amazon, but again, poaching keeps them on edge and seeing one is rather unusual. 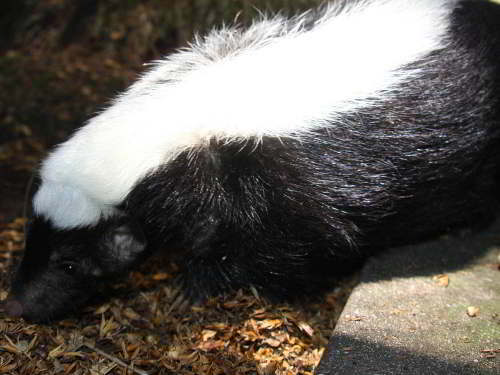 Striped Hognose Skunks are rather common too, but being mostly nocturnal, they are not seen very often. 8 species of small mammals are endemic to Ecuador 2 of which are restricted exclusively to the Park: Chibchanomys orcesi (Muridae) is a semi-aquatic mouse that lives in the high Andes up to 3000 masl and Caenolestes tatei (Caenolestidae), a marsupian. 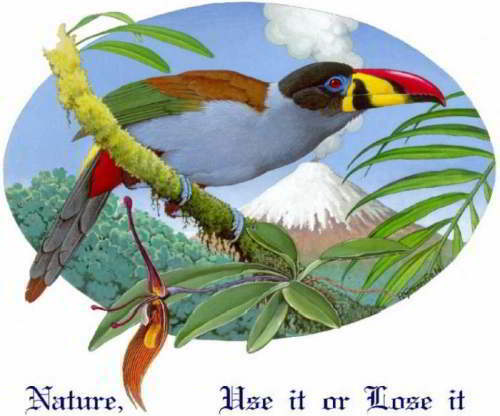 The avifauna of 152 species of birds known to the Park is characteristic of the paramo and montane forests of the Andes. 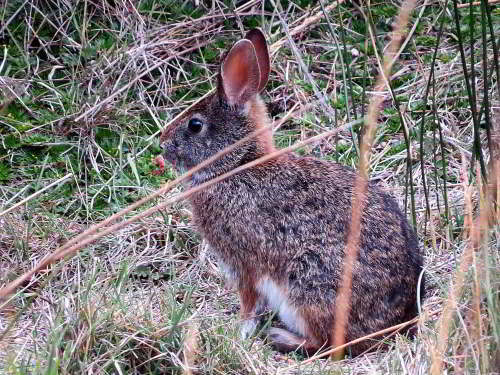 The most common families are: Trochilidae, Tyrannidae and Thraupidae. At least ten endemic species of the Ecuadorian Andes have been recorded: loro carirrojo, Hapalopsittaca pyrrhops, Coeligena iris, Heliangelus viola; Cinclodes piquigrueso, Cinclodes excelsior, Colibr� metallura gorgivioleta, Metallura baroni, Curiquingue or caracara caracara, Phalco boenus carunculatus and Schizoeaca griseomurina. 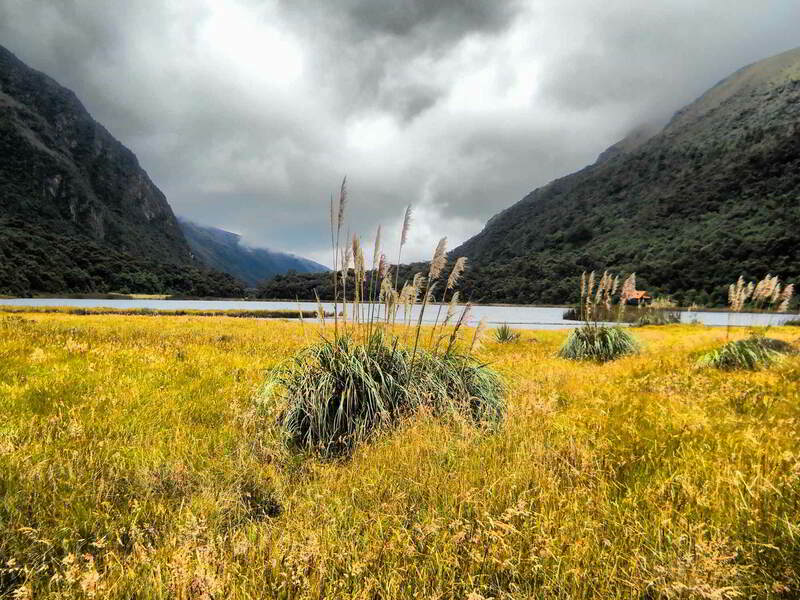 Cajas is also visited by migratory birds from North America. 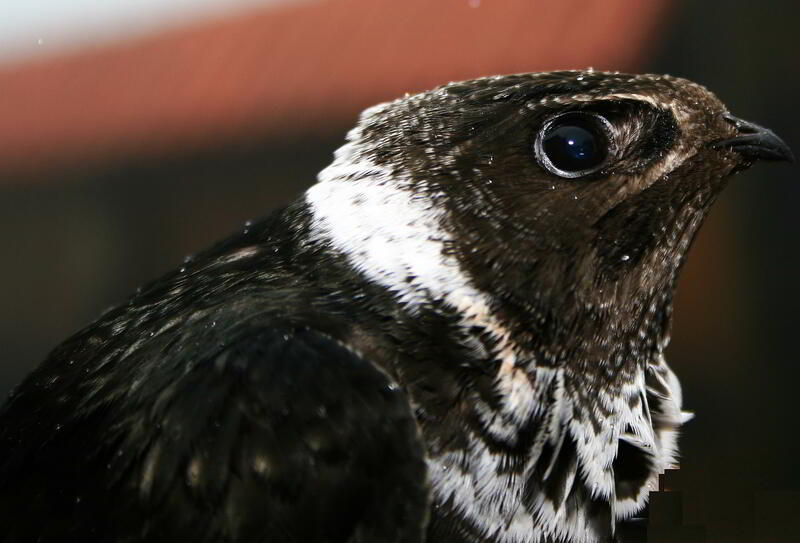 Between October and April, five birds travel long distances to the park: Actitis macularia, Baird's Plover, Calidris bairdii, Dendroica fusca, Falco columbarius and F. peregrinus. 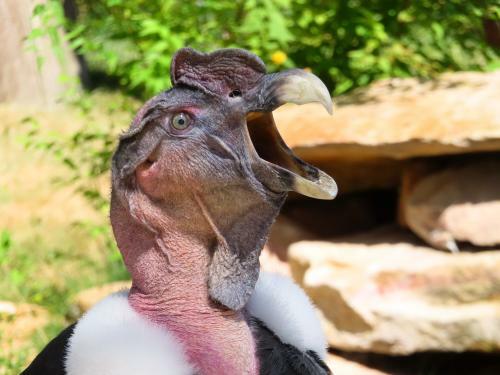 Condors nest near the Playas Encantadas Lakes. Sometimes a swift may race through the sky. 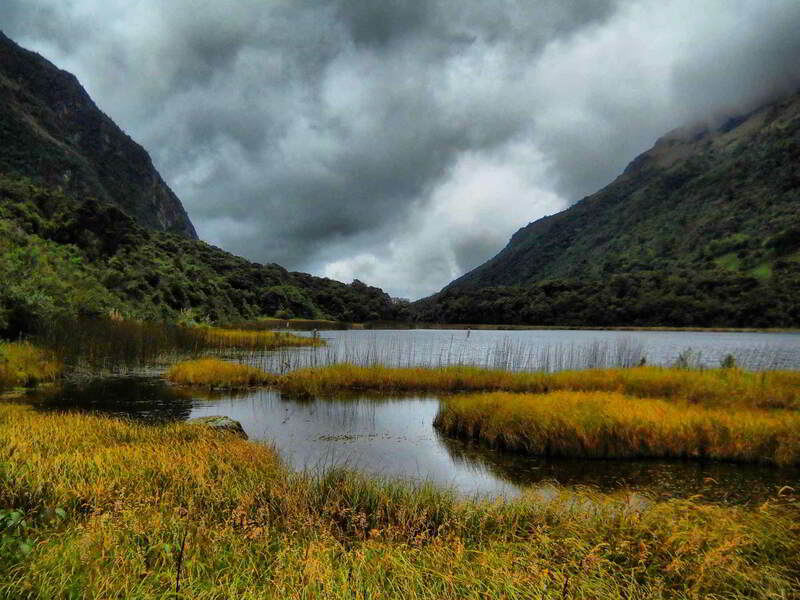 With 15 amphibians and 4 reptiles the area is home to a third of the amphibians of the Brachycephalidae, Bufonidae and Dendrobatidae families and half of reptiles of the high Andes of Ecuador. In 2005 a new species of col�brido (Reptile) endemic to the area of Soldados, Liophis sp. nov. Species restricted to the south of the equator are: Pholidobolus macbrydei, P. montium; Stenocercus festae. 5 species of amphibians are endemic to the Park: Atelopus exiguus, A. nanay; Eleutherodactylus cryophilius, E. rui dus and E. philipi. Threatened species are: Telmatobius niger, Gastrotheca pseustes, G. litonedis; Hyloxalus anthracinus, H. vertebralis, and Nelsonophryne aequatorialis. 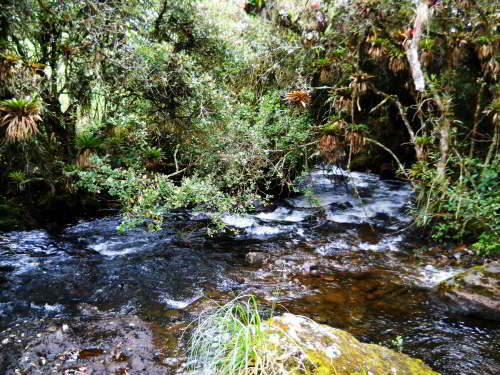 Or�ginally, the waters of high Andean were only inhabited by species of the pre�ador genus, Astroblepus, but in the course of last century several species of Trout has been introduced throughout the Andean region. 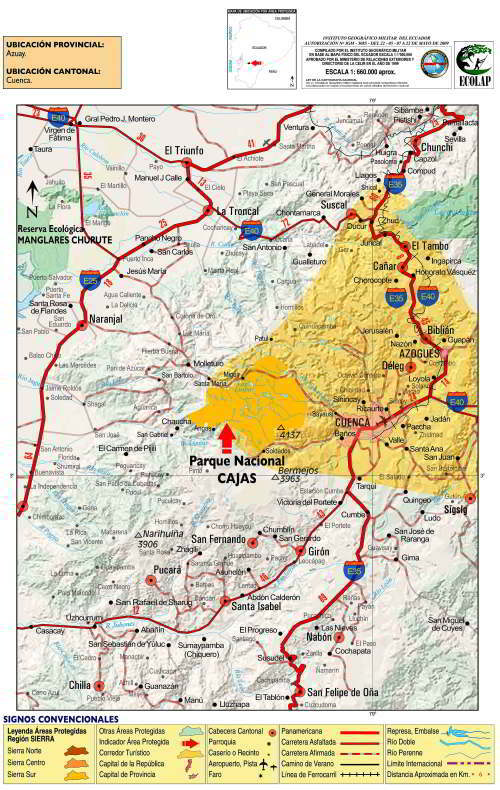 The main entrance is by the road that connects Cuenca with the coast: Cuenca - Molleturo - Naranjal. This road crosses the Park and is the most visited area of the park, where one also finds a small but well-done modern visiter center, at a short distance from Lake Toreadora, which is visible from the road. Cajas is part of the Ecuador National Parks Tour. The streams in the park are uninhabited by introduced trouts. 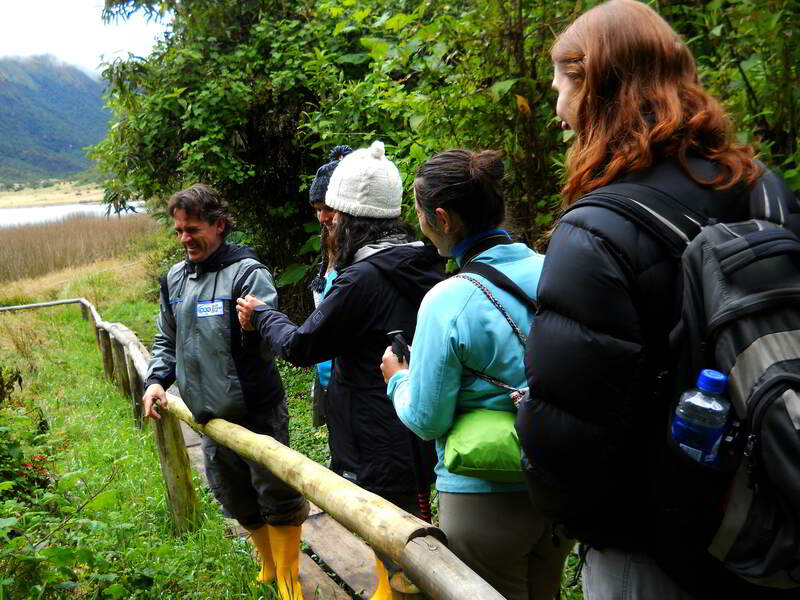 Visitors with their guide admire the Andean montane forest during a walk along a trail built by the park administration. 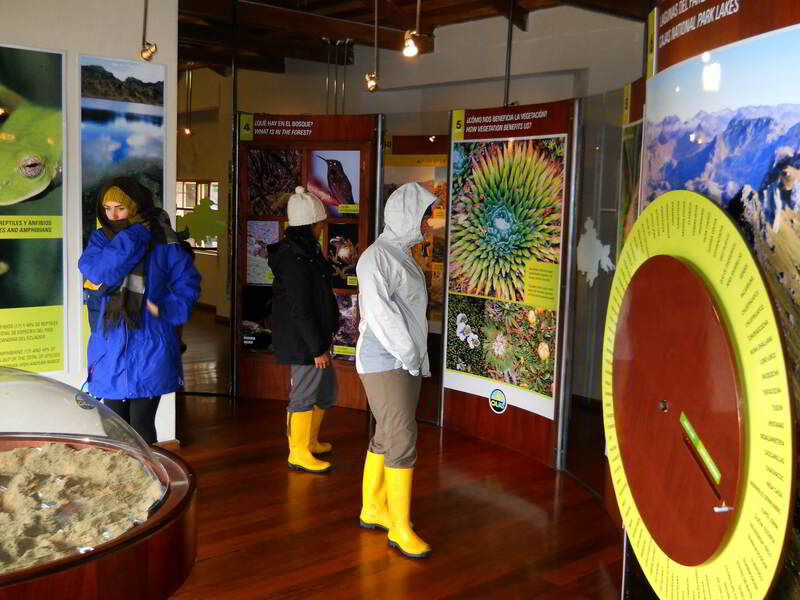 Anyone in normal condition can make the hike through the paramo of the park. Boots are provided for the walk.